Schwartz downplayed his status following Sunday's 23-20 overtime loss to the New York Giants. DETROIT — They did it their way — the Detroit Lions’ way — with one more collapse that officially eliminated them from playoff contention. The next step likely will be to find a new coach. 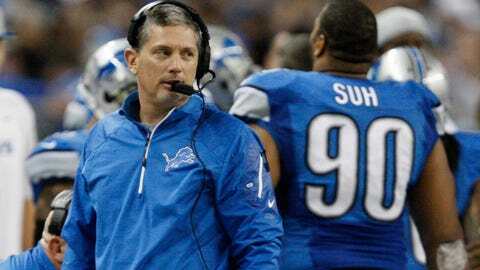 With the Lions' playoff hopes slipping away, Jim Schwartz was angry and frustrated -- with the fans. Change isn’t always better, but it appears to be necessary in this case. 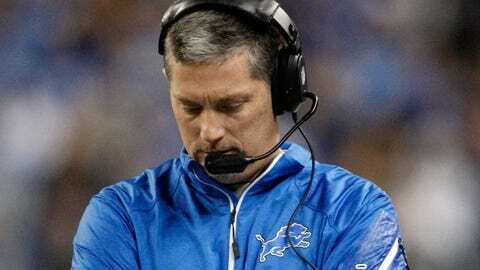 Jim Schwartz inherited the enormous baggage that goes with this Lions franchise, got them to 10 wins and the playoffs by his third year, but they have completely fallen apart in the second half of the season for the second straight year now. Schwartz downplayed his status following Sunday’s 23-20 overtime loss to the New York Giants, but the players realize they may have cost their coach his job. "There’s going to be scrutiny on everybody, not just Jim," receiver Nate Burleson said. "When it’s good, it’s great. The praise is everything you want. But when it’s bad, criticism comes like an avalanche. "We’ve got to be prepared for it. We’ve just got to let it happen and see what choices are made from here." Offensive lineman Rob Sims added: "Somebody will be judged unfairly, and have to go. That’s just the business. "You’re given a certain amount of time to make it right. If you don’t, see you later." Once in control of the division with a 6-3 record, the Lions lost for the fifth time in six games, turning the sellout crowd at Ford Field into an angry, booing mob. The bitter feelings only got worse as the night went on because Green Bay and Chicago both lost, meaning that the Lions could have been back in first place if they’d only beaten the Giants. A year ago, it was even worse around here with eight straight losses to end the season at 4-12. Put those back-to-back finishes together and the inevitable rumors suggest that Schwartz likely will get fired sometime after next Sunday’s regular-season finale at Minnesota. Asked if he expects to return for another year, Schwartz said following the latest heartbreaker, "That’s not something we’re worried about." "It’s hard enough dealing with this loss right here and getting the team back," Schwartz said. "We have a difficult week ahead of us, Christmas and everything else that goes into it. "I admire this team. I’m proud to coach the team. I’m proud to stand among these guys. They’re tough. They fight. "I think that’s what we’ll be concerned with." Matthew Stafford conceded that he didn’t think it was his place to lobby management to keep Schwartz, but the franchise quarterback who has struggled badly late in the season did say, "I love playing for him." It is 20 straight years now for the Lions without a division title, the longest streak of any NFL team that has been in existence that entire time. Detroit last won the division in 1993 when it was still playing in the old NFC Central. The only club that has gone a longer time without winning a division is the Cleveland Browns, who were AFC Central champs in 1989. The Browns, however, didn’t have a team from 1996-98 after their franchise got moved to Baltimore and before starting over with an expansion club. It appeared a few weeks ago that the Lions were going to end that drought, but all hope came to an end Sunday. After looking down and out at halftime when another Reggie Bush fumble and Stafford interception helped give the Giants a 13-3 lead, the Lions came to life to start the third quarter. They rallied behind a defense that forced five straight three-and-outs and took a 20-13 lead with 11:50 remaining. But the Lions then lived up to their reputation, failing to put the game away when they had a chance, just like they failed to put away the NFC North when they had the shot following injuries to quarterbacks Aaron Rodgers of Green Bay and Jay Cutler of Chicago. Stafford continued to be a giveaway machine, misfiring on a pass to tight end Joseph Fauria that sailed off of the rookie’s hands and deflected to safety Will Hill, who returned the interception 38 yards for a game-tying touchdown with 4:57 left. The Giants (6-9), who already had been eliminated from the playoffs, then converted a fourth-and-7 on their second possession of overtime to set up Josh Brown’s 45-yard field goal, six days after the Lions had lost to Baltimore on a 61-yarder. The Lions (7-8) not only committed a total of 21 turnovers over the last six games, they also blew fourth-quarter leads in each of the five losses. Of their eight losses overall, five have been by four points or fewer, including the last two by a combined total of five points. "It is hard to take when every game is close," Schwartz said. "We’ve come a long way, but we’re still not quite there, obviously. "We’re still a play away from turning these games around, whether it’s offense, defense or special teams." Five years ago, Schwartz took over a winless disgrace here in Detroit. It’s easily forgotten that he’s turned an often-uncompetitive organization into a playoff contender two of the last three years. The question is whether he can take them any further, which seems less likely after another late-season failure. Last year’s record was alarming, but so was this year’s failure to win a division that was so winnable. "The changes we went over these last four years, we’ve been able to get it going. Matthew has grown, Calvin (Johnson) has grown, into superstars. "Sometimes there’s just a brick wall in front of you and you’ve got to decide to just go through it. We just didn’t. We didn’t get it done. We didn’t get through the wall." Somebody is going to pay for that and it appears it’s going to start with Jim Schwartz.